Weddings can be expensive, and according to the Real Weddings Survey, the amount spent on weddings has increased for the second year in a row. While there’s some variation by region, and many couples go above and below the averages, the numbers give some interesting insight. 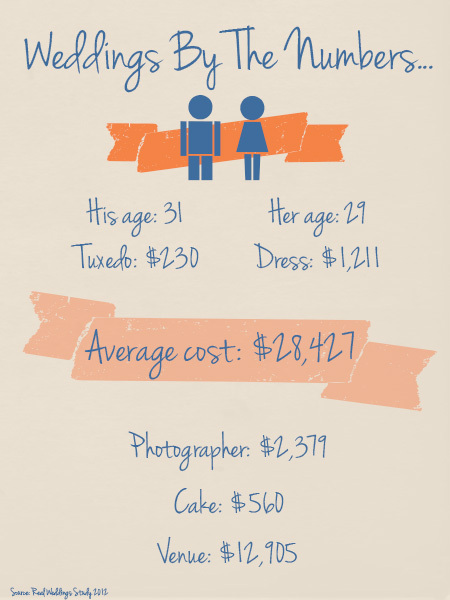 In addition to the figures in the graphic above, couples also spend an average of nearly $2,000 on their decor and flowers. This might seem like a lot, but it is worth thinking about what that will generally include. Decor costs can include everything from table cloths to lighting. It can also include other rentals, such as chargers, chair covers, and flatware. Flowers are a big part of most couples’ wedding dreams. From the bride’s bouquet to the reception centerpieces, they’re something that makes a wedding so very special. If you want to find out more about choosing the right flowers for your wedding, get in touch. Let us know in the comments if there’s anything you’d like to read about on this blog, too!